The campaign, in brief, is for an internet bank account with no regular fees. At its homepage you find a large image of Kasparov at the board next to the words: “Kasparov’s waiting for your move!” Lower down there’s “Free lessons from a grandmaster”, followed by videos of Kasparov talking about chess openings. MK: In his life he’s often determined the fate not only of kings but also of simple pawns. 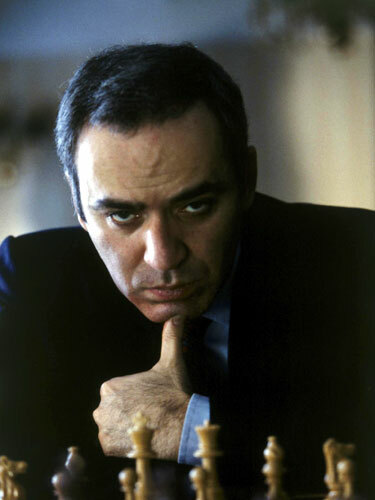 Ladies and gentlemen: Grandmaster Garry Kasparov. GK: Thank you very much. MK: How much would you charge for a chess openings course? GK: You’ll be surprised – not-a-thing! (the word is simply “nothing”, but Garry stresses all three Russian syllables) Go onto the internet and study on your own, though of course my help wouldn’t do any harm. GK: Don’t be afraid – on this internet customers don’t pay. MK: Welcome to our internet chess openings course – as you’ve all no doubt guessed, it’s the Russian Game. MK: Why is chess so popular in Russia? GK: Probably because in chess a pawn can become an important figure/piece. For the Polish Defence (1.d4 b5!?) they have feathers in their caps, and both speak Polish, but some more background is perhaps required: A curiosity of the videos is that while there’s much regret in chess circles that Garry Kasparov has chosen politics over chess, it’s also a cause célèbre (in Poland) that Marek Kondrat has chosen working for ING Bank (and a wine business) over “serious” acting. He’s one of the top Polish actors, probably best known for playing the main character in the wonderful “Day of the Wacko” (Dzień Świra). And each morning one of the best Polish actors thanks a Dutch bank that he doesn’t have to act any more. Yes? It would be better to write: each morning an average Polish actor, who by a fluke managed to play important roles, wakes up glad to be alive. And you won’t act anymore? In any case, in those rankings I’m a place above Kubica, which amuses me. You’ve got a young guy who whizzes around the world in a fast car and suddenly he’s overtaken by some great-grandfather of Lenin. Nice. Almost there! All that needs to be added is that Kondrat made his debut – “debiut” in Polish, *and the same word that’s used for chess openings* – as the 10-year-old star of the 1961 period drama “The Yellow Slippers” (“Historia żółtej ciżemki”). The name sounds even odder in Polish, as the “slippers” in question are those funny pointed medieval boots… Garry Kasparov never had a chance! MK: Welcome to the free internet chess openings school: Today, the Polish Defence. Garry points out the moves (in Polish! – though it’s almost the same as in Russian). MK: Have you heard of “The Yellow Slippers”? When we learn to play chess as children we all play the most varied of openings, though of course at a very primitive level. It’s only later, in the course of our chess and personal development, that we discover those schemes, those opening variations, that suit our taste and our chess understanding. But in my case it was different. The Scheveningen Variation of the Sicilian Defence, which in a very general sense was shown to me by my first trainer, Oleg Privorotsky, all the way back in 1972, became Garry Kasparov’s trademark opening, and served me faithfully during the course of my whole chess career. But above all else, in the decisive game of my World Championship Match with Anatoly Karpov, when I once again chose my main weapon, it didn’t let me down. And, having won what was probably the most important game of my whole life, on 9 November 1985, at 22 years of age, I became the youngest World Champion in chess history. MK: (in Polish) Garry, did you ever manage to beat your opponent on the first move? GK: (in Russian) In one move? No, only Chuck Norris can manage that. OMG! I had so much fun! The commercials are really well-made and it is nice to see chess as a business vehicle. Kasparow, Kondrat, and Chuck Norris all at once. Thank you, mishanp!! !